The recent edition of MCD#79 – Nouveaux récits du climat, invited editors Ewen Chardronnet and Julien Bellanger, has now been published in French, stay tuned for the English version. It showcase a collection of articles on topics of climate and art, the anthroposcene and activism by invited authors such as Alexandra Daisy Ginsberg, Donna Haraway, Marko Peljhan amongst many others. Denisa Kera, in discussion with Marc Dusseiller, Urs Gaudenz and Paula Pin, wrote a nice article about the most recent developments and activities in the global hackteria network. Hackteria’s response to the anthropocene are open science prototypes, which support inclusion and democratization of knowledge. Instead of a TED talk grand narratives of the homo faber, who will save the world with the next technological intervention, Hackteria homo ludens builds playful prototypes to explore alternative cosmologies, empower niche communities, and resist military misuses of technologies. 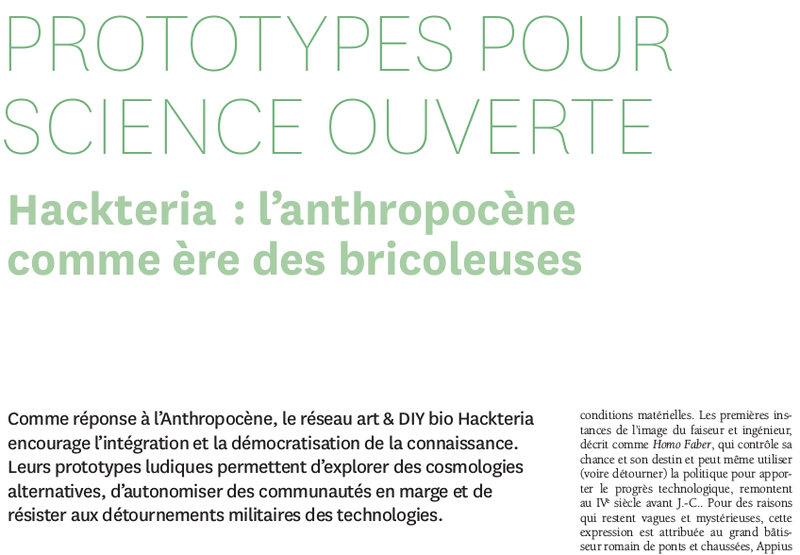 Prototype pour science ouverte – Hackteria: l’anthropocène comme ère des bricoleuses, by Denisa Kera. If you can’t read French feel free to download the original English draft “Hackteria Open Science Prototypes”. Anthropocène, occidentalocène ou capitalocène?, by Christophe Bonneuil. Climate games, by John Jordan.